Our LED Gloves have an array of colors in each each finger tip including red, blue and green. Control the flashing with the push of a button near the wrist, you can cycle through seven amazing modes in each glove - so you can pretty much make them flash in any pattern that you could want. The gloves themselves are white cotton gloves that are stretchy and fit almost any hand. 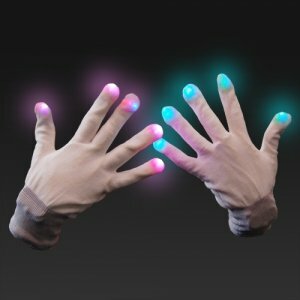 There are two short videos below to give you a great idea what these gloves are about - super powerful LEDs and amazing patterns at an absolutely unbeatable low price! * Stand out! Be seen over 1/2 mile away. * Smooth surface inside a€“ no wires! 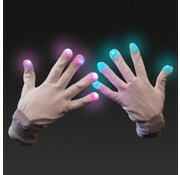 1 pair of LED gloves per package. Batteries included “ replace carefully. Flashing gloves not intended for children under 10. Washing gloves will result in defective functions and will not be replaced. Sorry..but if you put electrical things in the washing machine we can't help you!